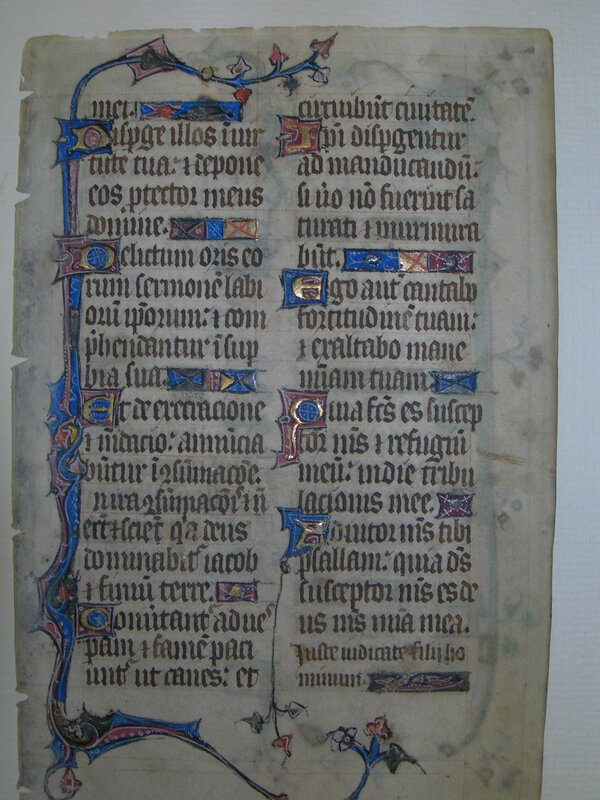 Text: Psalms 58:12-18 (recto) and 59:1-12 (verso). Reconstruction Note! 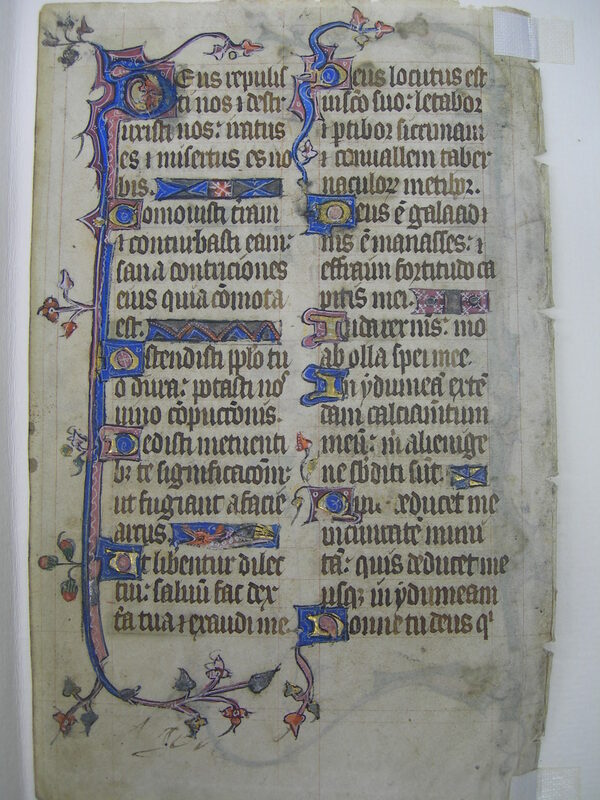 In Ege's original manuscript, this leaf followed what is now Leaf 17 in the Kenyon College portfolio; the latter followed what is now Leaf 17 in the Case Western Reserve University portfolio; and the Case Western leaf followed what is now Leaf 17 in the Cleveland Public Library portfolio. Together the four leaves contain the text of Psalms 54:19-59:12. Delíctum oris eórum, sermónem labiórum ipsórum; et comprehendántur in supérbia sua. Et de execratióne et mendácio annuntiabúntur in consummatióne: in ira consummatiónis, et non erunt. Et scient quia Deus dominábitur Jacob, et fínium terræ. Ipsi dispergéntur ad manducándum; si vero non fúerint saturáti, et murmurábunt. Quia factus es suscéptor meus, et refúgium meum in die tribulatiónis meæ. Adjútor meus, tibi psallam, quia Deus suscéptor meus es; Deus meus, misericórdia mea. ...my enemies: slay them not, lest at any time my people forget. Scatter them by thy power; and bring them down, O Lord, my protector: 13 For the sin of their mouth, and the word of their lips: and let them be taken in their pride. And for their cursing and lying they shall be talked of, 14 when they are consumed: when they are consumed by thy wrath, and they shall be no more. And they shall know that God will rule Jacob, and all the ends of the earth. 15 They shall return at evening and shall suffer hunger like dogs: and shall go round about the city. 16 They shall be scattered abroad to eat, and shall murmur if they be not filled. 17 But I will sing thy strength: and will extol thy mercy in the morning. For thou art become my support, and my refuge, in the day of my trouble. 18 Unto thee, O my helper, will I sing, for thou art God my defence: my God my mercy. Deus, repulísti nos, et destruxísti nos; irátus es, et misértus es nobis. Commovísti terram, et conturbásti eam; sana contritiónes ejus, quia commóta est. Ostendísti pópulo tuo dura; potásti nos vino compunctiónis. Ut liberéntur dilécti tui. Salvum fac déxtera tua, et exáudi me. Deus locútus est in sancto suo: lætábor, et partíbor Síchimam; et convállem tabernaculórum metíbor. Meus est Gálaad, et meus est Manásses; et Éphraim fortitúdo cápitis mei. Juda rex meus; Moab olla spei meæ. In Idumǽam exténdam calceaméntum meum: mihi alienígenæ súbditi sunt. Quis dedúcet me in civitátem munítam? quis dedúcet me usque in Idumǽam?